The popular Kia Rio has been fully redesigned for its fourth generation this model year. Coming with a new "tiger-nose" grille, even more technology features, and a more spacious and comfortable interior, the 2018 Rio is sure to be a big hit with Phoenix drivers. 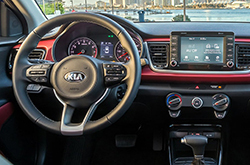 If you've been searching for new cars in the Arcadia, Biltmore and Encanto areas of Phoenix, keep reading the rest of our 2018 Kia Rio review below to find out about this exciting new generation of the popular car. What Are the Tech Features on the New 2018 Rio? The latest tech features on the 2018 Kia Rio in Phoenix are spread out across two available body styles (sedan and hatchback) and three available trim levels (LX, S and EX). Depending on which trim you choose, drivers will be able to imbue the Rio with a multitude of impressive interior convenience features like hands-free Bluetooth, a rearview camera, UVO3 voice recognition, Android Auto and Apple CarPlay, a seven-inch floating touchscreen and a six-speaker sound system. The Rio's cabin now comes with refreshed front seats that have been boosted for comfort, while the car's exterior gets Kia's latest grille design and new head- and fog-lights, giving the Rio a more aggressive stance. Standard wheels on the new Rio are of the 15-inch steel variety, though many 2018 Kia Rio reviews prefer the alloy wheels on the range-topping Rio EX. The 2018 Kia Rio, for sale now on Camelback Road, is powered by a Gamma 1.6-liter GDI four-cylinder engine that has been enhanced for this latest generation. This newly enriched powertrain has improved the Rio's efficiency, while also helping increase its overall driving dynamics. Drivers can opt for either a six-speed manual gearbox or a six-speed automatic on the 2018 Rio, both of which help move the sedan's 130 horsepower and 119 lb.-ft. of torque with vigor. 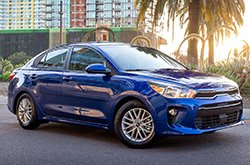 You can discover even more about the 2018 Kia Rio by test driving it at Camelback Kia. Contact us today! The Kia Rio Is Here! The esteemded 2018 Kia Rio should be on your list of vehicle options, especially if you've been out browsing for the 2018 Ford Fiesta, Honda Fit, Hyundai Accent and the Toyota Yaris near Phoenix. You may find that it is a definite match for you, with its polished design and clever features. 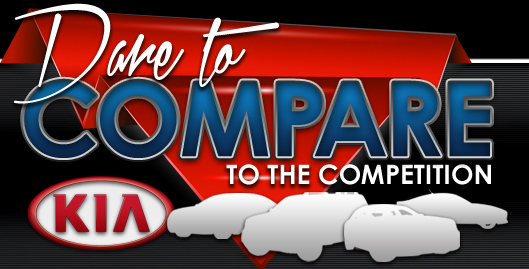 Decide if it's right for you using our 2018 Kia Rio report as well as the included vehicle comparison tool; and afterward, make sure you view exclusive incentives on our site. We're a resident car dealer with many lease offers on new and well-maintained used car models, including the Kia Rio. 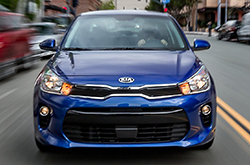 We hope our point-by-point 2018 Kia Rio review helped you find the info you need to make a final buying decision. 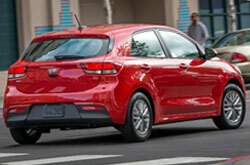 Explore the Kia Rio in Phoenix, AZ; scheduling a test drive at Camelback Kia is a simple process with our form. Also take a minute to watch our video clip, which spotlights the car's innovative equipment!